Under the cooperation agreement between the Royal Theater and the Music Festival El Greco in Toledo, he Headlines Choir and Orchestra of the Teatro Real will return to the cathedral of the capital manchega next Saturday, 27 October, to 20 hours, to interpret A German requiem, from Johannes Brahms (1833-1897). The second version of A German requiem, released in 1869, with two numbers rather than the first, grants the initial score greater balance and cohesion: the numbers 1 Y 7 They are related by content and, even, by their identical end; the numbers 2 Y 6 Brahms enhance the mastery of the art of counterpoint, would never leave; the numbers 3 Y 5 evoke the tradition of oratorios, with touching soprano and baritone alone, respectively. Finally, the number 4 It works as the axis of the work, which articulates very fluently texts of the Old and New Testaments, Lutheranism used in field professing composer. Phrases carefully chosen by Brahms, more humanistic than religious, despoil the death of his heroic and glorious appearance, finding in it a place of refuge and deliverance: eternal peace. Two renowned singers will perform numbers 2 Y 5 Sheet Music: soprano Elena Copons and baritone Michael Kupfer-Radecky, next to Titular Choir of the Teatro Real, directed by Andrés Máspero, which has in this play a major role. 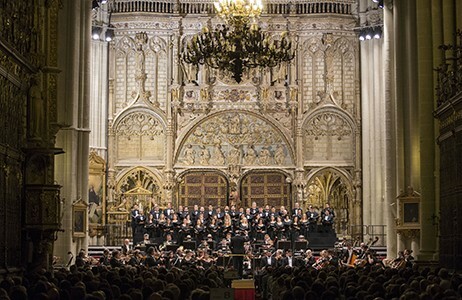 They will perform with the Head of the Royal Theatre Orchestra, under the direction of Ivor Bolton, will return to the Cathedral of Toledo, where already addressed, with great success, he Requiem from Wolfgang Amadeus Mozart, in 2014 and the Stabat Mater from Gioacchino Rossini, last year.